Fake IDs seized in Philadelphia by U.S. Customs & Border Protection agents. College students looking to score fake IDs in Philadelphia this summer are probably feeling a squeeze on demand as the fall semester gets underway. U.S. Customs & Border Protection officials say more than 500 fake IDs have been seized in Philadelphia since May, with the latest shipment intercepted on Aug 15. 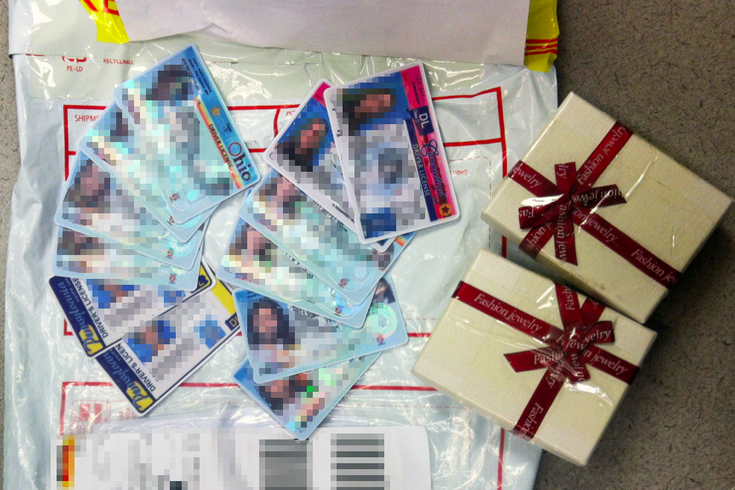 The counterfeit cards included licenses from more than 20 states, in addition to Nigerian driver's licenses, and were sent from locations such as China, Canada and countries in southwest Asia. Authorities said the quality of the fraudulent cards varied from poor to nearly identical to the actual IDs issued by various states. Some even included scannable bar codes. Most of the seized licenses have been turned over state and university police investigators. The rest will be destroyed, officials said.